A really interesting lunch idea, side dish, or appetizer that combines some different flavors successfully. 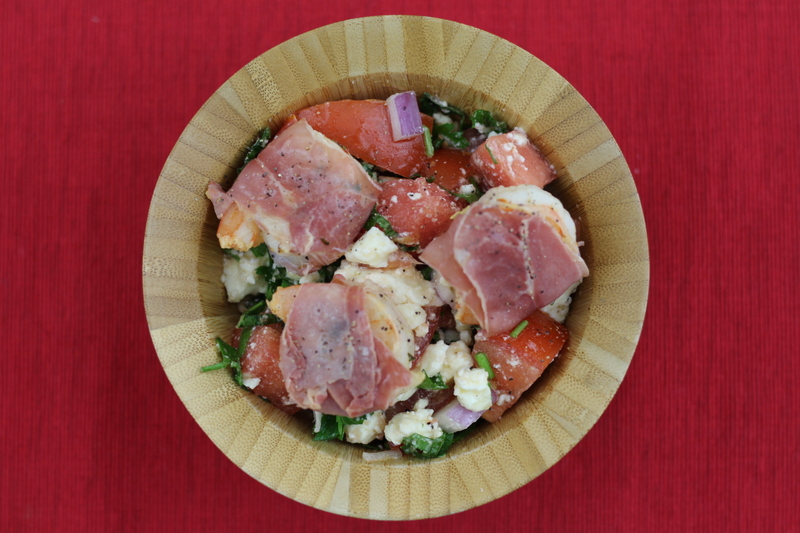 Watermelon, prosciutto, shrimp, mint, and onions? Sounds weird, but it was worth a try! Of all the recent shrimp recipes from around the web I've been trying out, this one was the most unique. Many of the others were either a pasta, taco, or grilled shrimp recipe! LOL. 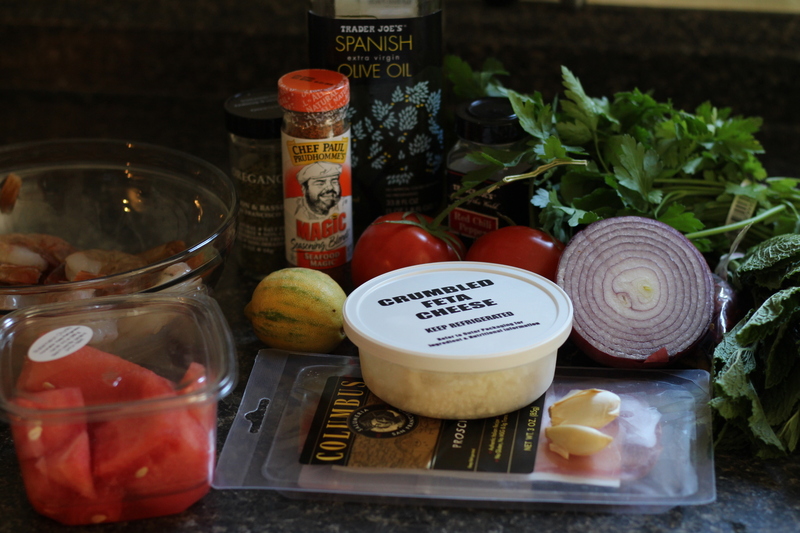 So how could I turn down something as tasty-sounding as Prosciutto-Wrapped Shrimp with Watermelon-Tomato Salad? Though I probably wouldn't eat this for dinner per se, it would make a great lunch or appetizer. 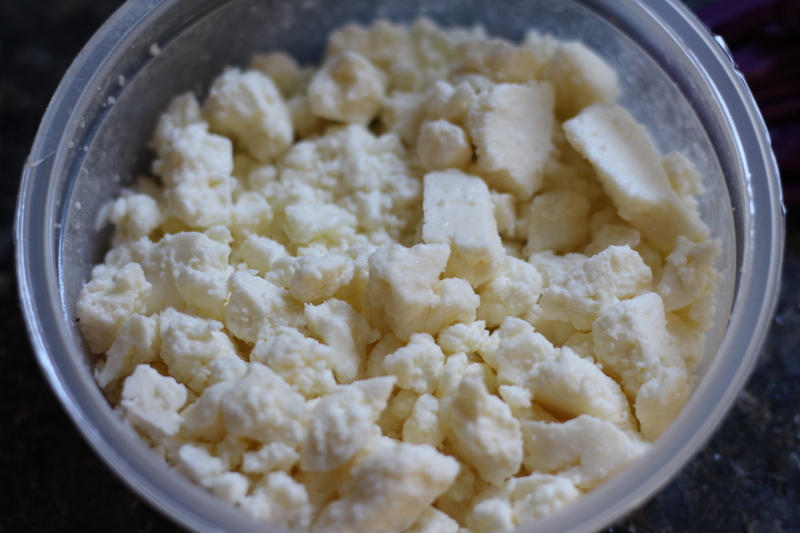 It's simple to make, and certainly looks fancy! The first step is to marinate the shrimp for a few minutes. 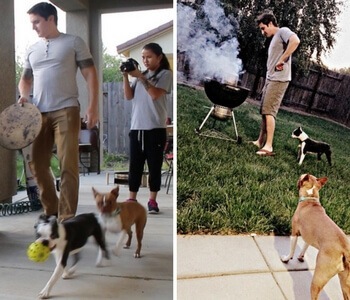 I did this in the beginning, then started cutting my veggies to multitask and save time. It's already looking pretty good! 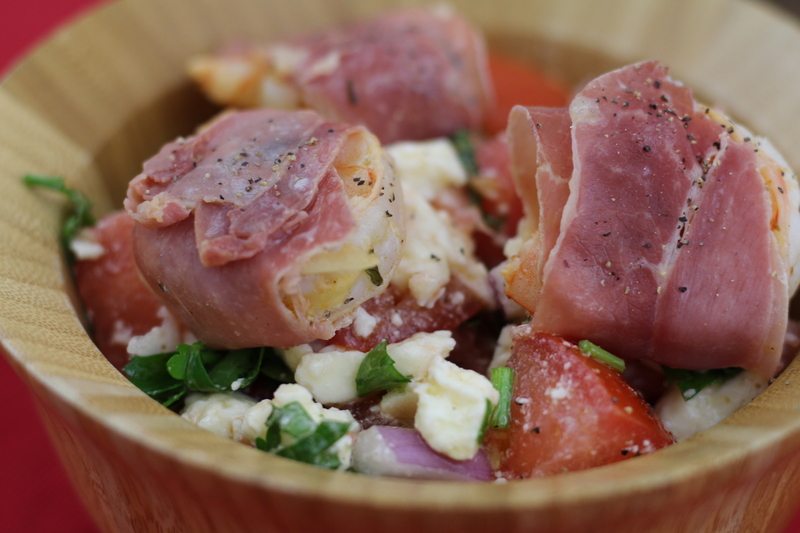 Once the tomatoes and watermelon are cut and mixed with the feta cheese, you can take out your prosciutto and start wrapping the shrimp. For me, the prosciutto wrapped shrimp turned out a little too salty. 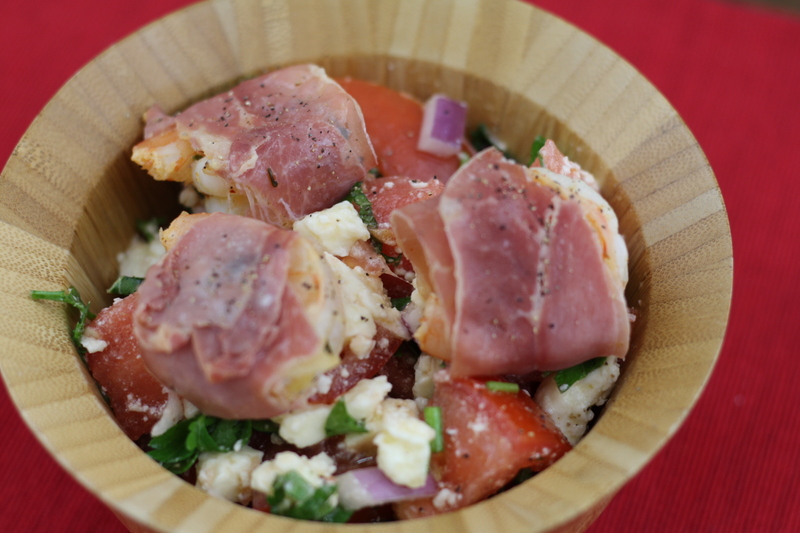 I'm not sure if this was from the way I cooked it, or that I used too much prosciutto on each piece of shrimp. 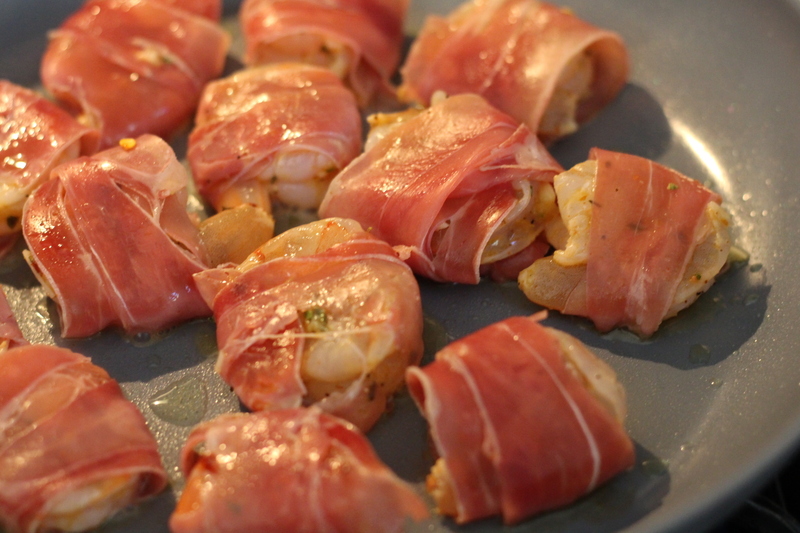 I did use jumbo prawns, but was able to get a double-wrap from each piece of prosciutto. Next time I'll try a single wrap. It will not be as stable, but probably come out less salty. Cook the shrimp and prosciutto long enough on both sides to cook the shrimp all the way through. 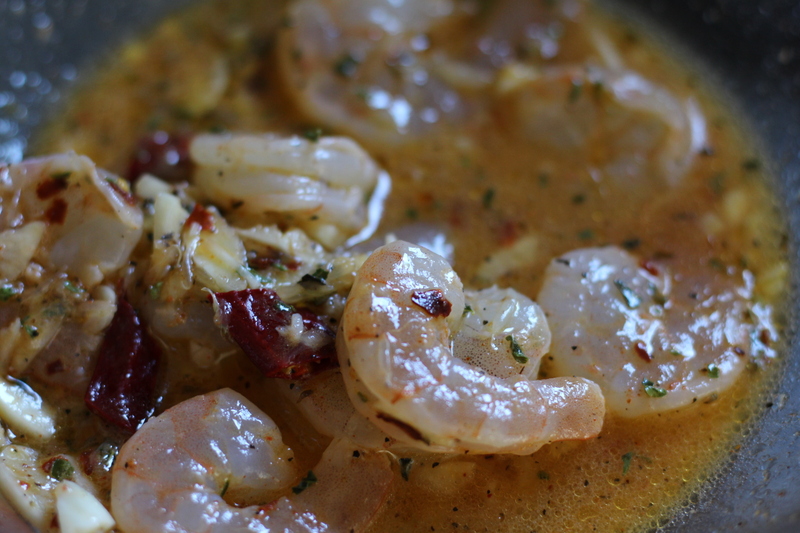 Don't overcook it, or your shrimp will turn out tough and rubbery. 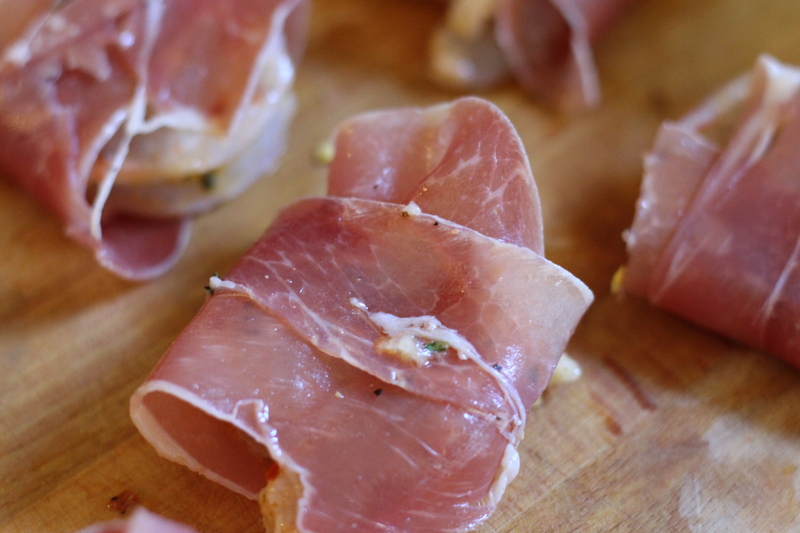 Prosciutto doesn't need to be cooked, so you don't need to worry about that part of it! Serving is quite easy. 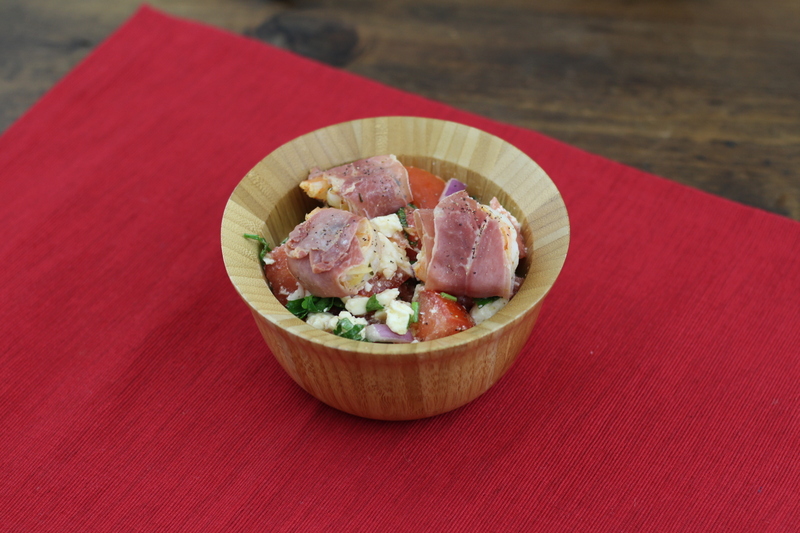 Toss your tomatoes, watermelon, feta, parsley, and mint (and other ingedients) in a large salad bowl. Serve into smaller bowls, and top with the shrimp. I topped it with cracked pepper. Check out this other weird watermelon recipe. Who would have guess that a grilled watermelon would sound so tasty? !